Here at Laroma we are fully qualified to provide a range of massage experiences. 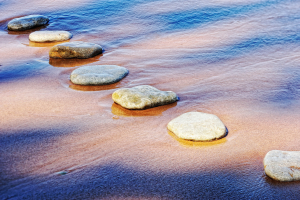 When we travel we discover new treatments and train to bring these back for the enjoyment of our clients, offering the most comprehensive range of massage treatments in the area. All are designed to promote a healthy body, mind and spirit. We offer a huge range of wonderful, effective and sometimes unique Massage Therapies which can help improve your mental, physical and spiritual health and wellbeing. Massage Therapy can benefit people who suffer from a whole range of ailments or simply just help you relax, unwind and let the stresses and strains of modern life fade away! Amazing treatment, great staff, feeling so great and relax having my massage , would be definitely be back for more massages ! promised a brilliant review as Jay gave me a hot stone massage few months back, completely recomend and the double massage and facial we had (me and my daughter) by the girls was also fab. 5 stars, thanks Lauren. hard work will pay off 🥰😘 brilliant place you have. I had the deep tissue massage with Jamie all I can say is wow, back and neck feel amazing definitely will be a regular thing now. 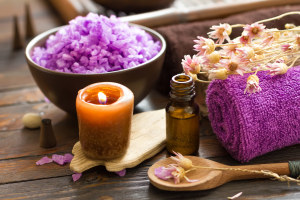 Aromatherapy is a natural treatment using essential oils to maintain and improve health and wellbeing of the individual. A unique massage using a lit candle to melt warm butter oils which reduce tension, nourish the skin and provide a soothing aroma. 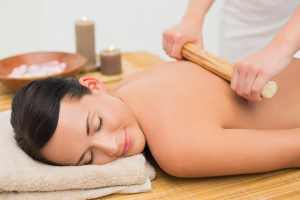 Deep Tissue Massage is great for chronically tense area’s such as stiff necks, low back tightness, and sore shoulders. Hawaiian massage is not just a physical experience, it’s also healing on the mental, emotional and spiritual levels. 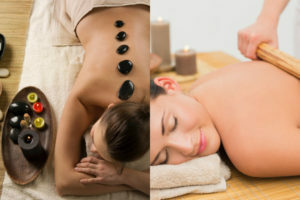 The Himalayan Mineral massage is a unique treatment using salt stones which are heated and used to massage the body. Holistic Massage really focuses on the relaxation and peace of the mind as well as releasing tension within the muscles of the body. These too unique massage treatments combine to provide a truly relaxing, invigorating and rejuvenating massage experience. A full body Swedish massage followed by soothing honey facemask with honey and ginger tea. Performed by two therapists combining basic Swedish Massage, no hands massage & Lomi Lomi, a unique experience is created! 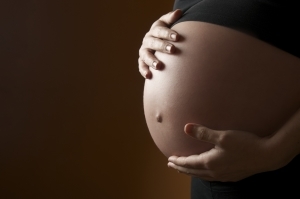 Pregnancy massage promotes relaxation, soothes nerves, and relieves strained back and leg muscles. Seashell Massage is deeply relaxing and luxurious, using coconut oil, leaving your skin soft & moisturised! Warm Bamboo Massage is a unique new therapy that relaxes tight muscles instantly and painlessly, results go deeper and last longer! 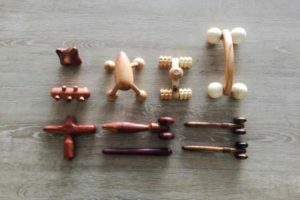 Woodland Massage is a unique new therapy using specific tools to relieving knots, tension and stiffness! If you are unsure which type of Massage Treatment will be most beneficial for you, please feel free to give us a call on 01903 201104 and we will be happy to help you. To book your appointment for any of the above treatments, call Laroma on 01903 201104 or email us using the form below.